Summer goals were a hit this year. 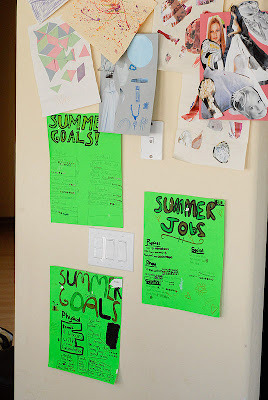 Each year we have the kids sit down at the beginning of the summer and write some goals for what they want to accomplish. Last summer we tried to motivate them to finish their goals with a cash reward. Didn't work. I was bugging them the whole summer to get things done, and it was a whole heck of a lot tougher on me than it was on them. So this summer we decided the Wii game they'd been knitting their heads together trying to come up with enough money to buy may be a good lure. They worked their little hearts out hitting tennis balls, reading, doing sit-ups, banging out melodies on the piano, taking younger cousins under their wing, reading the scriptures, and helping out on every end. I'm not a big video game fan, but I'll tell you one thing, this baby is worth it's weight in gold. Amazing the motivation a good reward can provide! This summer our oldest "earned" her airplane ticket to ballroom dance camp by practicing her violin a certain number of days. That goal kept her so motivated. I'm so curious what kinds of jobs and goals were on your kids' lists. Do you have them work on special goals during the school year as well? Thanks for all your inspiration and great ideas! Oh enjoy the music that will now fill your house! I love that they all have goals, I have to try that! Hey I nominated you for a blog award, check out my blog to read more! Oh I see some great family fun in your future. My kids and (husband) love to play rock band together. I like to pretend like it's good bonding time. I like the songs a little better then guitar hero, but there still are a few sketchy ones. Have fun!!!! Good idea with the goal bribe I might have to try that. 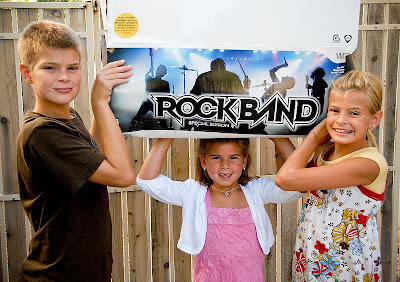 Your kids are going to love "rock band" - Good idea with the bribes, I love it! Ah... the bribe. Always works. But you're right - it has to be the right bribe. hey I don't know if you guys remember me. My sister-in-law Julie Funk Huish loves to read your blog so I decided to check it out. You guys have such a cute family. It's fun to see how everyone's lives have changed since good 'ol BYU days. Success it sweet, no matter how they were nudged forward toward the goal. I too am a firm believer in rewards. Sometimes it's the only way to get them excited about work. But I do know that once they get started and good habits are formed, they see their growth was as important as the prize. Trey is nearly 9 and we've been slowing moving him toward earning his Wolf in cub scouts since we got home from Utah. This past Monday we told him if he could just complete the goals, we would let him rent a PS2 game. Six days later it was done. He's downstairs now enjoying his racing game. What a relief for both of us!